It does not take long before that smell starts to fill the kitchen. If the weather is just right and the windows are open, anyone in the vicinity is starting to catch a whiff of what’s cooking on your stove. And it is making them hungry. It’s making them want to rush home and do the same thing – fry up some chicken for dinner. Warm and crispy, tender and juicy fried chicken! Almost everybody loves fried chicken and has their favorite style. My mother didn’t fry chicken nearly often enough to suit me. I loved it when I got to shake the chicken in the paper bag, otherwise known as dredging. That was lots of fun! When I was older, I would help to make the mandatory mashed potatoes, deviled eggs and salads that accompanied the main dish. For me, this meal was all about the taste. It never occurred to me that, while it looked so simple to my young eyes, you could say that frying chicken takes a lot of effort. The cook has to continually return to the stove, check the chicken and turn the chicken, all the while dodging that hot oil that might pop up and burn them. They have to somehow know when the chicken is done. Even in our family of four, my mother had to cook in batches. That meant she had to do a lot of standing and waiting, watching and turning those chicken pieces before we could finally sit down to eat. What if you had a way to make fried chicken at home but did not have to worry about dodging oil splatter? What if there was no longer a need to stand over a hot frying pan, trying to guess if the chicken was almost done, completely done, or whoops!a little too close to being burned? Wouldn’t that make your weekly fried chicken night a lot more fun and relaxing for the chef? Thankfully, there are now several brands that have recently come out with a frying machine called an air fryer. An air fryer is like a smaller version of a convection oven. It will cook your food at a very high temperature using dry, hot air that circulates around the food by using a fan that’s built into the fryer. You can easily set an air fryer on top of your kitchen counter while you’re letting it cook for you. 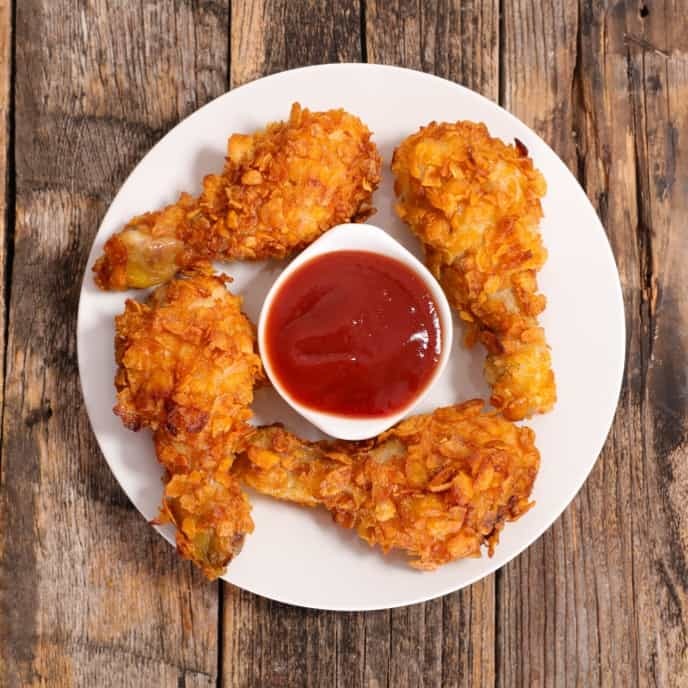 One benefit of an air fryer is that you will not be using a large amount of oil that stove-top fried chicken uses. That will save you money but more importantly, you will not be putting all that grease into your body. If you ever ‘fry’ your chicken in the oven, you know just how hot that oven will leave your kitchen. 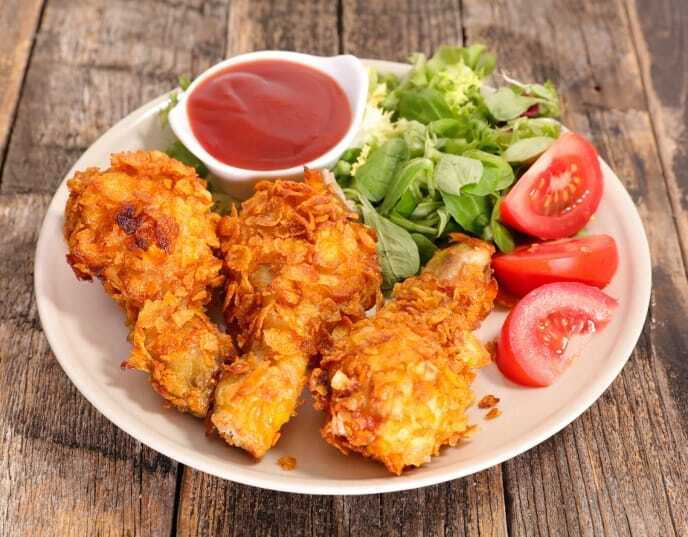 Gone are the days of an overly hot oven and house when you fry your chicken in an air fryer. An air fryer will let your chicken turn out crispy on the outside but still tender and juicy on the inside. Air fryers use a lot less oil that any deep fryer. Anything you fry with hot air will have a much lower fat content. That will reduce the amount of fat and calories your body is taking in and can even help with weight loss. You preheat your air fryer, just like an oven. 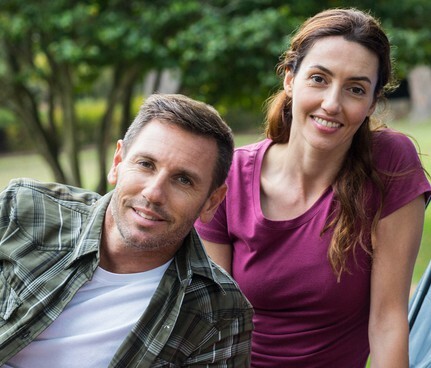 Unlike a traditional oven, though, the timer on the air fryer will turn off the machine, causing the hot air to stop circulating as soon as the cooking process is finished. This keeps the chicken from becoming dry or burning if you don’t turn it off immediately. Air frying your chicken is really going to make a big change in your outlook on frying chicken. After you prepare the pieces of chicken and place them in the basket, you can get on with making the rest of your meal, or maybe you can put your feet up and chill out for half an hour before dinner. Wouldn’t that be a nice change? 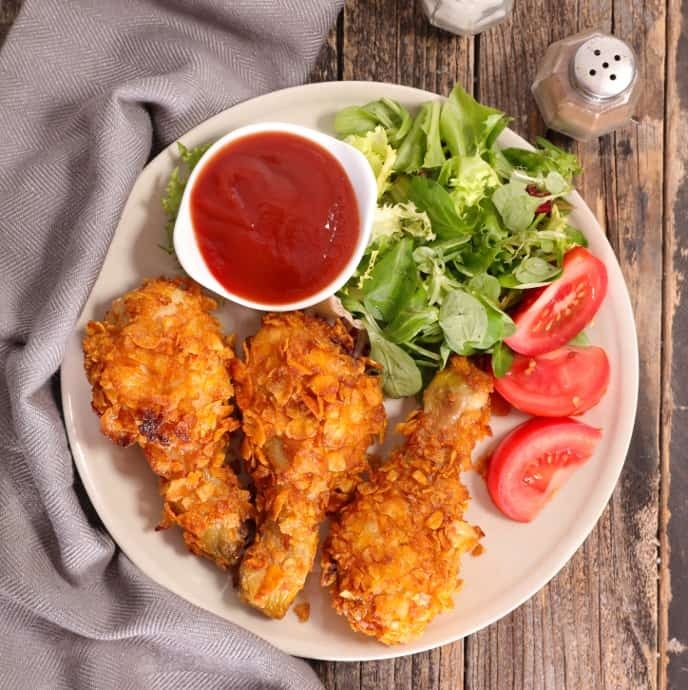 This tender and juicy air fryer fried chicken is super delicious with crispy skin on the outside and healthy. Preheat your Air Fryer to 380F. 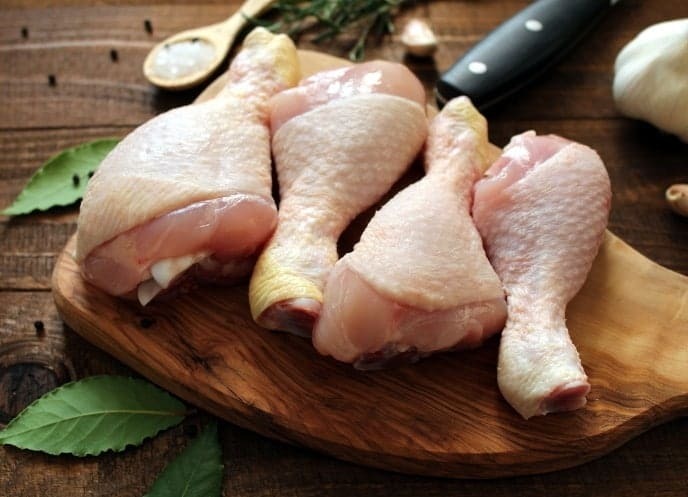 Make sure each piece of chicken is dry by patting them with a paper towel. Then set the pieces on a plate or a shallow tray. Pour the following ingredients into a large bowl. 1½ Tablespoons of Old Bay Seasoning, a cup flour, and 1 teaspoon seasoning salt. Whisk them together thoroughly. In a separate large bowl, beat the egg. Put the chicken pieces through a 3-step dredging process. First, drop a few pieces into the flour mixture and return them to the tray. Continue this process until all pieces have been dredged in the flour. Next, in the same way, dredge them in the egg. Finally, drop them back into the flour for a final coating and shake off the excess flour. Finally, spray all of the pieces of chicken with the oil. Be sure that each piece gets covered completely. Place the chicken into the bottom of the Air Fryer cooking compartment on grate. Set your Air Fryer to cook for 25 minutes, or until chicken reaches 180F. Use an instant meat thermometer to be sure it has reached 180F. It is going to be hot, so be careful as you remove the fried chicken from Air Fryer. While I was looking around at different recipes to try with my air fryer, I was actually stunned when I saw a recipe for making a whole chicken in one of these! The first thing you have to do is check the capacity of your air fryer. I’m sure you’ll probably need to purchase a smaller bird. Anyway, this certainly shows the versatility of these machines. You may want to give this one a try after you’ve made the fried chicken two or three times. Preheat the air fryer to 375 degrees. Pat the chicken dry and then drizzle with avocado oil. Season with half the seasonings. Place the whole chicken in the air fryer basket, shut the lid and set the timing to cook for 30 minutes. Open the air fryer, flip the chicken and add the remaining seasoning. Cook the chicken for an additional 30 minutes. Once the chicken has finished cooking, open up the air fryer and remove the chicken from the basket. Allow it to sit for 5 minutes before slicing and serving. I loved the fried chicken recipe in the air fryer.It was so good and not greasy at all. Recipe was great, my granddaughter and her friend really liked your fried chicken recipe. Now will use this recipe on my other grandchildren. Yes it will come out brown. I Loved it!!! I made Crispy air fry Thighs, in the Oster countertop air fry…..was the first time, I couldn’t believe how delicious, crispy and golden. Cooked deplly, in the time the recipe described. I am very thankful for that recipe!!! Do you have to flip the pieces at all during cooking time? Yes you can flip at halfway cook time. Hi. Completely new to air frying. My son bought me the Ninja 4-qt capacity air fryer that air frys, roasts, reheats and, dehydrates. My question is this: The recipe above for the whole chicken, the way it is worded I take it as total cook time is 1 hour. Is this correct? (States set timer for 30 mins. Flip the chicken and cook for an “additional” 30 mins). Thank you for your time.and recipes. Yes 1 hour total cook time. Just tried this recipe. It is FANTASTIC! I added some hot sauce to the egg just for a little extra kick. Can’t wait to try a whole chicken on the rotisserie. Delicious and crispy! I added ground red pepper to the flour mix and hot sauce to the egg. I live the crunchy coating and moist chicken. Yes canola or olive can spray is fine. This is the best recipe for fried chicken in the air fryer!!!! Will use again!!! Made the chicken exactly as stated except I used canned butter flavored spray instead of oil in a spray bottle. The skin was crunchy and the chicken was soooooo moist. Some of the best I ever had. Best to flip the chicken half way thru cooking time. This is the first time I have used my air fryer for chicken. I was very impressed how good it came out! Crunchy and juicy inside. I’m mad at myself for waiting so long to try chicken. I’ve done vegs, fish, and French fries. All were delicious. Really delicious! Tastes like fried chicken with a kick of cajun spice! Best thing is you don’t feel bloated afterwards like you would if you had eaten deep fried chicken. Really easy to make! Amazing! Thanks for the recipe! I did drumsticks and 30 min was enough for cooking time. Love this!!! Perfect. I swapped out half the flour for protein powder, added chipotle tabasco in the egg wash and added a bit more spice (pepper and salt) and it came out perfectly.